Opening a classy bottle of wine, or even a bottle of two buck chuck, doesn’t have to be a chore anymore. Gone are the days of using a manual corkscrew and spilling wine on the countertop or on your expensive clothes. An electric wine opener is hands-down a better option. Electric openers vary in price point and their battery capacity, but they all operate on the same concept. Place the opener on top of the bottle of wine and press a button, then let the opener do all of the work. Many units also come with a foil cutter, further making the process of opening a bottle of wine simple. After the cork is removed, all you have to do is press a button and have the opener return the cork. It doesn’t get much easier. Don’t make a mess at parties or embarrass yourself in front of a significant other, by toiling away with a traditional corkscrew. Opt for the convenience and efficiency of an electric wine opener instead. Which Electric Wine Opener do you choose? 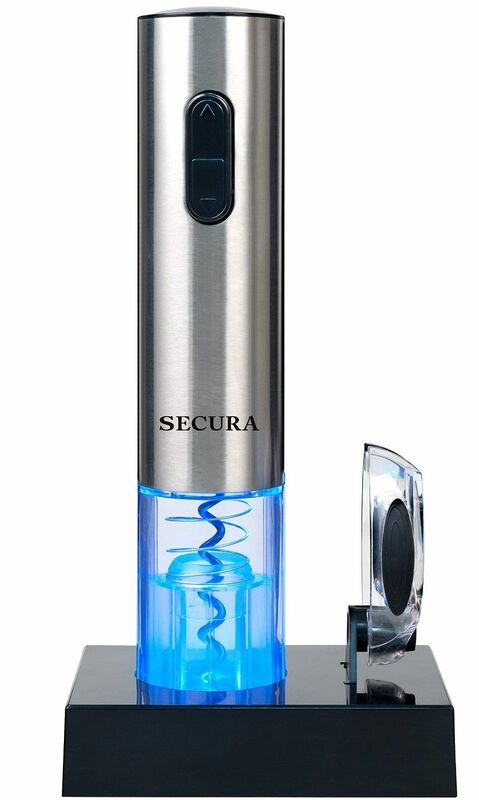 Our pick is the Secura Stainless Steel Electric Wine Bottle Opener with Foil Cutter. It’s got 4.8 out of 5 stars on Amazon, with 1425 customer reviews.